I was a working student for Carol Lavell when I graduated from college. For those who don’t know Carol, not only is she a member of that very elite club of American riders who’ve placed fourth individually at the Olympic Games, but she also studied chemistry at the Massachusetts Institute of Technology. To say that Carol is brilliant would be a colossal understatement. That brilliance carries over into her teaching and in the way she thinks about riding. I remember feeling so overwhelmed in my lessons with her back then—she sees everything and asks for a reason behind every aid I apply. Why did I take back on the left rein just there? What effect should it have had? Did it have that effect? Now what are you going to do about it? She operates at an incredible level. At the time that level of instruction was wasted on me. I couldn’t appreciate that level of precision, didn’t yet realize the level of finesse required to ride at the international Grand Prix level. I’ve trained and shown several horses up the levels since, and each one has made me more subtle, more sophisticated in my approach. Carol recently came to visit and to watch me ride Puck who, at 7, is quite behind the traditional curve in his education. He’s 17.2 hands of bull-in-a-china-shop power, and keeping all his parts in order is a full-time job. Carol challenged me to ride in her gorgeous, subtle nuanced way, and we had a great lesson that made him a ton better, but it got me thinking about what, exactly, the lowest common denominator of Puck’s current developmental struggles is. At the end of the day, his big, bouncy and bold self wouldn’t let me easily control his shoulders. I couldn’t easily and consistently turn my horse. So for the last few weeks I’ve been spending the first 10 to 15 minutes of each ride just walking and just turning. 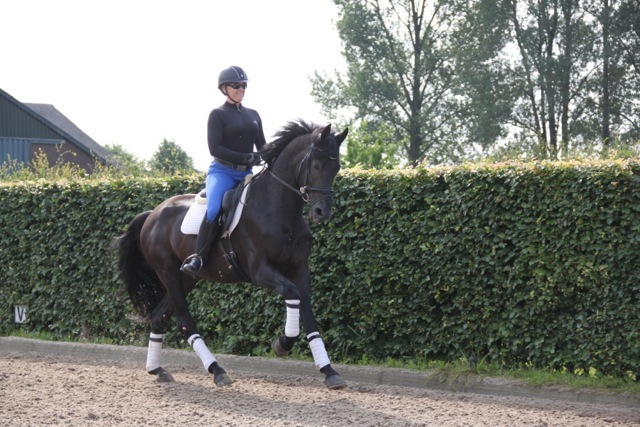 He has to face both reins from both legs, carry himself honestly, and then, from the lightest aid, he has to turn. If I move both hands to the left, he is to immediately turn his shoulders to the left. If I move both hands to the right, he is to immediately turn right. It sounds so, so simple, but for the first few days, it was a challenge for him. And then, one day, it got easy. And lo and behold, he got easy. Or at least easier. When I can turn his shoulders at the walk from a light aid, 100 percent of the time, he carries himself in the trot and the canter better. He collects more easily. He’s more focused and attentive. It’s simultaneously shocking and not surprising at all, how much things improved from basic, simple work. I preach it all the time. But this was another level entirely, a level of nuance and subtlety that I didn’t think my young horse could appreciate. I went home to Virginia last weekend and rode Swagger, now 4. He’s also a big, powerful Labrador Retriever in horse form. He’s currently struggling to stay sharp and in front of the leg, and the more I would get on his case about moving forward, the more he’d crash onto my hand. I spent my first ride on him at home doing the simplest things—walk-halt-walk transitions, until he could do them without crashing against my hand when I applied my leg. Then walk-trot-walk. And finally trot-canter-trot. The improvement from my first ride to my second was phenomenal. Of course there’s no One True Way to make a horse. Just as I need to be able to elicit a response from the smallest aid, the horses in my program also need to be tolerant of mistakes, accept strong aids when applied, and take a joke. Everything in moderation, including moderation. And of course in the training of any horse, one must temper one’s expectations to the capability of the horse at the time: If I asked Puck or Swagger to make a precise transition to the piaffe, and then got on his case when he didn’t, that would be unfair, because of course as young horses they’re not yet capable of answering that question. But that doesn’t stop me from asking the questions that I ask them as if they’re FEI horses. They can make walk-halt transitions like an FEI horse. They can make walk-trot transitions more like an FEI horse than I’ve been expecting, and more of the time than I thought. Of course when they make mistakes, when they fail to respond perfectly, I’m empathetic, patient and fair. But there’s no reason I can’t ask the question, no reason I can’t begin to teach my horses now about the nuance they’ll need later.